A sporty looking yacht with an appealing balance to quality and value.This is Sea Ray's classic, glorified, express-cruiser layout. Enter through the 430 Sundancer's wide open salon with a centrally positioned galley, a forward master stateroom and aft guest stateroom. The 430 Sundancer's length allows each stateroom to have its own ensuite head, taking full advantage of available space.Galley benefits include an upright refrigerator/ freezer, microwave/ convection oven and stove top providing ample cooking power. Most important, there is superb storage in this area and throughout the boat.Underneath her redefined hull lines is her deep-v hull fitted with tunnels housing Twin 425 QSB Cummins Diesels with Zeus Pods and joystick control. Precisely designed to increase efficiency and performance.This updated yacht has been maintained by it's original loving owner. Updates include, New canvas (2018), New carpet (2018), New custom bow sun-pad (super comfortable)!Mint condition with only 200 hours, lift kept and priced to sell, bring offers! United Yacht Sales New Jersey would love to guide you through a personal showing of this 43' Sea Ray 43 Sundancer 2009. 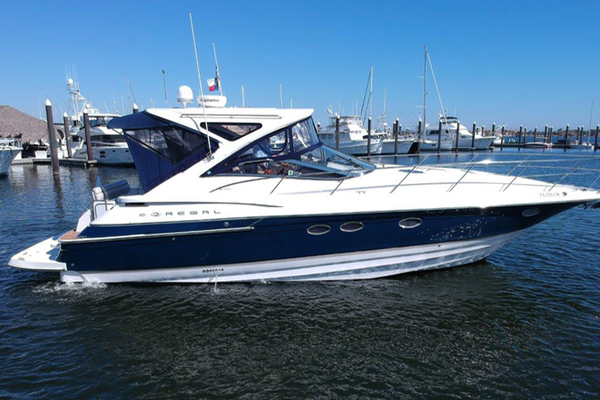 This yacht for sale is located in Long Beach, New York and priced at $389,000. For a showing please contact us by filling out the form on this page and we will get back to you shortly!